Spring birding in full flow at Rainham RSPB on Saturday and Sunday 18/19 April 2015. Swallows moving through and the occasional Sand Martin, with Chiffchaffs, Blackcaps, Whitethroats, Cetti's, Reed and Sedge Warblers in song. 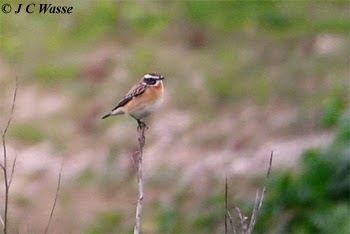 Several Wheatear along the riverside path and 'Rainham Ridge' plus a stunning Whinchat. A handful of Whimbrels noted flying on to the reserve at high tide on the Saturday and along the Thames shore on the Sunday. A Bar-tailed Godwit changing into 'sum plum' was on the shore in the company of 2 Black-tailed Godwits (one bright 'sum plum') and Whimbrel on Sunday. A lone Greenshank and a few Dunlin (5) added to the passage wader mix on the reserve the day before. A Hobby twisting and turning after insects over Wennington Marsh / Serin Mound on Saturday was a delight and would have been the highlight for me. However, it was overshadowed by the Great White Egret seen flying from Kent into Essex by the Dartford Crossing shortly after 2 pm on Saturday. Excellent directions being called helped me to get on this monster, and even at distance the mass of trailing feet was impressive. 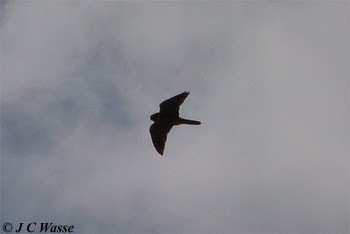 Sadly it was only briefly in view as it soon disappeared behind the estate heading north. Adult Mediterranean Gulls flew downriver on both days. Small Tortoiseshell, Peacock and Green-veined White butterflies showed well in the sunshine along the Thames path on Saturday. 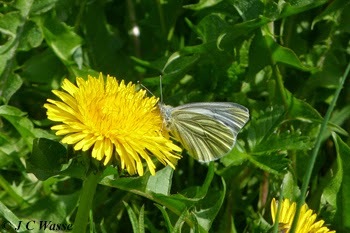 Several more photos from the weekend added to the 'Latest UK Bird Photos' and 'Butterflies' pages.